It is once again Tuesday and we have just released the 188th batch of iPhone ringtones. If you are a subscriber they will all be available in your feed in iTunes by the time you read this as usual. We have just released the fourth and final batch with 6 brand new Christmas iPhone ringtones that will help you and your friends get into the holiday spirit this December when the iPhone rings. To get the update just check your RingtoneFeeder Christmas 2008 podcast in iTunes and refresh (right-click and select Update Podcast) then click the “GET ALL” button if the tones are not all being downloaded. Do drop us a line if you face any issues. All the Christmas ringtones will also be available for manual download for the subscribers from December 10th. If you have not already subscribed you can get the entire Christmas ringtones pack now at just $4.99 which will provide you a total of 24 holiday ringtones. We have just released the second batch of 4 with 6 brand new Christmas iPhone ringtones that will help you and your friends get into the holiday spirit this December when the iPhone rings. 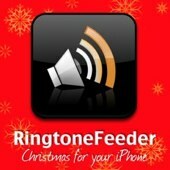 This holiday season, RingtoneFeeder is wishing iPhone owners a Merry Christmas with 24 unique iPhone optimized Christmas ringtones. You get 6 ringtones each week for 4 weeks this December for only $4.99 – starting Monday December 1st 2008. If you are an existing RingtoneFeeder subscriber you can subscribe from the members section and just select the Christmas Pack 2008 from the drop-down list and click “Order” – otherwise just subscribe from here.